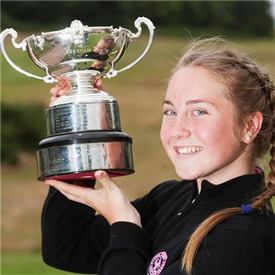 Talented youngsters from across the country will play off in Monday’s national final of the Abraham Trophy for England’s most improved girl golfers. The field of 21 competitors includes last year’s winner, Sophie Wheeler of Orsett Golf Club in Essex (Image © Leaderboard Photography) who is defending her title. The players have all qualified for the final on the basis of handicap reduction. It takes place on the Masters course at The Nottinghamshire on Monday, 25 July. The Abraham Trophy immediately precedes the English girls’ championships for U18, U16 and U14 age groups which will all be played at The Nottinghamshire from 26-28 July.